WARNING! Never observes the Sun through your binoculars, monocular, telescope, Spotting scope etc.! Observing the Sun, even for the shortest fraction of a second, will cause instant and irreversible eye damage. When using your BCI optical products during the daytime, do not point it even close to the Sun. BCI Binoculars are designed and manufactured by BCI whom strive in cutting edge design and user-friendly equipment that is comfortable as well as appealing to the eye. "The Closer You Look, The Better It Gets!" The basic mechanism of binoculars consists of four parts - object lenses, ocular lenses (eyepieces), prisms and focusing system. Object Lenses are the larger lenses at the front taking light into binoculars. The bigger they are, the more light the binoculars gather, and usually the finer the image's resolution is. It is therefore necessary to use binoculars with large object lenses in low light conditions. Ocular Lenses or eyepieces are the smaller lenses at rear delivering the final images to user's eyes. The bigger they are, the less eyestrain is put upon the user. Prisms are pieces of triangular glass inside binocular barrels correcting the image, which would otherwise be inverted and reserved without them. Focusing System lets the user adjust focal length of binoculars so that images appear sharply in eyes. Magnification (how close it makes things appear), Resolution (sharpness and clarity) and Light Transmission (brightness) are important for binoculars performance. Ignoring a single key point will be at the expense of the others erodes a binoculars optical quality. Powerful magnification is useless if the image is dim or fuzzy. Larger binoculars may provide greater magnification, but it requires larger objective lenses to enhance resolution and brightness. When considering brightness, there are limits to the amount of light the eye can receive. During the day, it needs to eliminate some light, while at night it needs to transmit more. Therefore, some larger objective binoculars are ideal for night while smaller objective binoculars are better for day. Most importantly, know the intended use and try before you buy. Mountaineering, Camping, Hiking, Nature viewing; Marine Sports, Fishing; Traveling; Bird watching; Specter Sports; Theatre; Stargazing; Museum; Hunting. Magnification or Power: Binoculars are referred to by a combination of numbers, e.g., 10x 50mm. The first number refers to the power of the binocular. It indicates the size to which an object is enlarged. For example, an object 1,000 meters away when viewed with 10x binoculars appears only 100 meters away, or 10 times (X) larger than with the naked eye. Higher magnification does not necessarily mean better. If the magnification is too high, the object does not appear clearly due to binoculars shake (caused by a slight trembling of the hands.) Generally, binoculars shake is not a problem with magnifications of up to 8x. You can also use binoculars with a 12x magnification without binoculars shake once you become familiar with them. Generally, the higher the magnification, the narrower the real field of view, and the lower the brightness. Take 7x50 and10x50 binoculars (both featuring objective lenses with the same effective diameter) for example. Although the object appears bigger when looked at through the 10x50 binoculars than through the 7x50 model, the lower magnification model offers a much brighter image and a wider real field of view. It is therefore important to choose binoculars with an appropriate magnification. Resolution: Resolution is a measurement of the binoculars ability to distinguish fine detail. Better resolution also provides more intense color. Resolution varies directly with the size of the objective lens. All else being equal, a larger objective lens will always deliver more detail than a smaller one regardless of the magnification. Actual resolution hinges on a variety of factors: the quality of the optical components, light transmission through the binoculars, existing atmospheric conditions, optical and mechanical alignment (collimation) and visual acuity of the individual. Light Transmission: The size of the objective lenses determines the amount of light that reaches the eye. With larger the objective lens, you can have better brightness and sharpness of the image seen through the binoculars. There are two prism styles for binoculars - Porro Prism and Roof Prism. Porro prism system gives the user better perception of depth and stereoscopy by offsetting the prisms making the binoculars size bigger than comparable roof prism model. It has a distinctive shape characterized by the use of a combination of two right-angle Porro prisms and, externally, by the offset positioning of the eyepieces from the objective lenses. 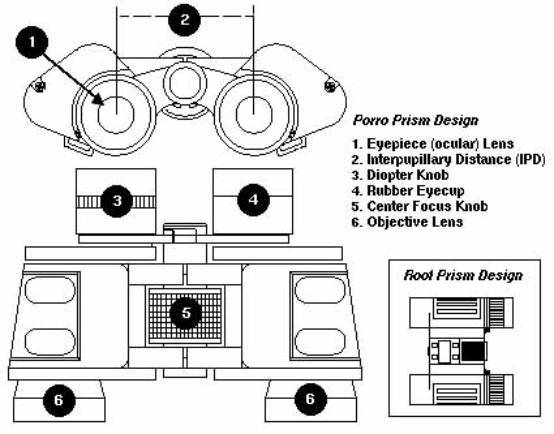 Roof prism system offers more compact bodies with the prisms positioned in line with object lenses and eyepieces. Prisms are positioned one over the other, lining up the objective lenses and eyepiece centers. The result is a more compact design, allowing pocketsize binoculars to have full-size power capabilities. Prism structure decides the exterior shape of binoculars. Typically, roof prism binoculars are slim and straight while porro prism binoculars are bigger in horizontal direction needing more space for prisms. BCI products have a variety of appearances to meet individual user's taste. Generally known as opera glasses. "Galilean binoculars" were named after their inverter, Galileo GALILEI (1564~1642), the Italian astronomer. 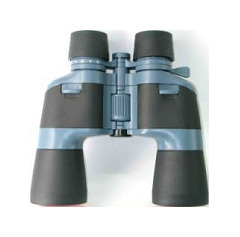 These binoculars consist of convex lenses for the objectives and concave lenses for the eyepieces. They form upright images. With a simplified prism-less optical system, Galilean binoculars feature neither high magnification nor a wide field of view (e.g. 430BR 4x30mm binoculars). Focusing system acts as the co-coordinator between the user and the binoculars. Apart from fixed focus models, all other BCI binoculars have a Central Focusing mechanism. The focusing wheel at the center of binoculars can be turned to focus on the targeted object. 1. Hold the binocular up to your face in the normal viewing position, using both hands to hold each barrel firmly. 2. Binoculars offer a wide range of pupil distances so anyone can use Nikon binoculars in comfort. While you look at a distant object, carefully move the binoculars barrels downward or upward so that both fields are correctly aligned, forming a perfect circle. Pupil distance is properly adjusted. BCI uses two types of diopter adjust systems. Right eyepiece diopter adjusting in which the user turns the right eyepiece ring. 1. Set the Diopter Knob (see diagram) at zero. 2. Look through the binoculars at an object that is at least 100 feet (30 meters) away. 3. With the lens cover or your hand, cover the right Objective Lens so that you will be looking through your left eye only. 4. Rotate the Center Focus Knob until the object you are viewing with your left eye is sharp and clear. At this point the object is in focus. 5. Remove the lens cover (or hand) from the right Objective Lens and cover the left Objective Lens so that you will be looking through your right eye only. 6. While looking at the object, rotate the Diopter Knob until the object you see through your right eye is sharp and clear. At this point the object is in focus. 7. Now with a turn of the Center Focus Knob, only, both near and far objects can be brought into focus. Focus with your left eye. Adjust diopter with right eye. When the diopter is adjusted, turn the central focus knob to focus on the object. Central Diopter Locking (such as UCF items) in which the user presses and releases the diopter button behind the focusing wheel to twist adjust and pushes down the button to lock the setting. With your diopter setting adjusted and locked, your vision requirements are stored without adjusting each tine you use the same binoculars. Understanding the importance of immediately catching moving objects with binoculars in some circumstances, BCI has developed a number of fixed focus models (compact, full size, water-proof) with pre-fixed focusing. If you are going to watch races for fast-moving spectator sports, or going sailing, these binoculars are perfect to use provided a recommended minimum distance of 15~50 meters (different models has different pre-fixed optical system) exists between you and the object wanted. Some models with individual focusing (e.g. you can adjust the diopter of both eyepieces independently. Focusing and diopter adjustments are performed simultaneously, but a change of object requires both rings. Focus with your right eye. Optical coatings reduce reflection both internally and externally and thereby increase the amount of light that reaches the eye improving brightness and contrast. All BCI products employ high-tech coated Optics helping to increase the amount of useful light coming into the binoculars, thus providing an image that is brighter, sharper and clearer. Generally speaking the more layers optics is coated the better the image quality is. Having every single surface of lenses and prisms coated with light-enhancing chemicals, BCI binoculars promise high light transmission efficiency. In addition, most BCI optics can be treated with a layer of Ruby Coating on top of the normal coatings. It protects user's eye from UV emission and further improves the light transmission. It offers brilliant, crisp daylight viewing and is especially suited for use over water, snow an in other bright conditions. Coated: Lens and prism surfaces are coated to improve light transmission capability. Fully Coated: All air-to-glass surfaces are coated. Multi-Coated: One or more surfaces of prisms or lenses have been coated with multiple films. Fully Multi-Coated: All air-to glass surfaces have multiple films. Ruby Coated: This coating consists of 14 layers of multi-coating on the objective lenses and is characterized by ruby-red coloring on the objectives. It provides excellent bright daylight and glare conditions viewing because it filters out red light. Hydrophobic (water-repellent) Coated: High-tech military coating now for sports optics. With it condensation from rain, fog or snow forms in more smaller droplets than on other coatings. Such smaller droplets scatter less light, which results in increased light transmission and a clearer vivid image. Field of view is the angle of the visible field measured from the central point of the objective lenses. The bigger the value, the wider the field of view, and the easier it is to locate the object. The wider the field of view the better for watching moving or large-scale objects. Field of view is the width in meters or feet of the area you see 1000 meters (1094 yards) away. You may see the expression in degrees too, thus the term being Angle of View. One degree equals about 17.5 meters (57.4 feet) of width at 1000 meters. High power binoculars usually have a narrower view angle compared to lower power binoculars. More efforts are needed to keep the image stable if you hold the binocular with hand. Let BCI binocular holder & tripod do the job for you. The binoculars with wider view angle can give user a more comprehensive visual perception. BCI has many Wide Angle binoculars. They are particularly needed for sporting events and camping. In wide angle binoculars, the prism are specially ground to have their refraction angles widened. BCI Zoom Binoculars are designed to have an extent of magnifications. For example, BCI CT126050 binocular have a low of 12 magnifications and a high of 60. By moving the zooming lever at the outside of the right barrel, any magnification within the extent can be gained. This feature presents you with a scope of viewing effects. Fogged lenses and wet prisms are no fun to binocular users. BCI Water Proof series is the solution to them. Equipped with thoroughly concealed bodies and nitrogen filled barrels with O-rings, these binoculars are totally waterproof. Fog formed inside the lenses as the result of sudden temperature change will dissipate sizes within one minute. With many models in different sizes to select, they are highly praised by people like fishing lovers, camping fans and snow skiers. Eye relief is the distance between the eyepiece and the eye point. When you place your eye correctly at the eye point, you can see the whole field of view without any shading. If the eye relief is too short, you cannot place your eye at the eye point and the field of view is partially shaded off. High eye point binoculars with longer eye relief (15 mm or longer) are recommended for eyeglass wearers---people wearing glasses or sunglass are likely to suffer from eyestrain. BCI Long Eye Relief Binoculars can be very beneficial. Achieved by using bigger than normal eyepieces (e .g. CT series), this feature allows the user to place the binoculars at a longer distance from eye without affecting field of view, thus relieving the efforts of eye muscles to focus on the image. Image stability of these BCI binoculars is also improved enabling the user to look for longer time. Eye relief is the distance between the eyepiece lenses and the eye point at the time of focusing. BCI long eye relief models ensure comfortable, appropriate viewing, and make it possible for wearers of glasses to see clearly up to the periphery. To accomplish proper focus setting, first pull the lever to maximum power position and pick an object at far distance. Then rotate the central focusing wheel to set focus for left barrel. Next, adjust the right eye diopter until the image is focused for both eyes. Focus setting is now completed. View angle narrows as the magnification increases. The bigger the view angle, the easier find the position of an object. Therefore it is recommend that you set the power at lowest level and locate the object before zooming it in for detailed viewing. Some BCI series Binoculars (e.g. 842ZX) are armed with the best available BaK 4 Prisms. These prisms are made from high-density optical glass, which eliminates internal light scattering, bringing you the image of highest possible fidelity. Hold the binocular about 30cm away and look through the eyepieces; you will see a perfect round if the prism is BaK 4. In the case of BaK7, the image is square with grayish edges (cause loss of light, resulting in reduced image brightness). The exit pupil is the bright circle as seen on the surface of the eyepiece from about 30 cm (1 feet) away when you point the objective lenses toward a bright light. Binocular brightness depends to some extent on the diameter of the human pupil. If you use binoculars with an exit pupil diameter nearly the same size as your own pupil, the light entering the binoculars will reach the eye most efficiently. As a human pupil normally opens 2 to 3 mm in daylight, binoculars with an exit pupil of around 3 mm will provide sufficient brightness. However, the human pupil extends to about 7 mm in the dark, so binoculars with an exit pupil diameter of around 3 mm provide insufficient light in the dark, resulting in a dark image. Therefore, binoculars with large object lens such as 7 X 50 (exit pupil 50/7 = 7.1 mm) will be advantageous for birding at dawn or dusk. Relative brightness is obtained by squaring the exit pupil. Same as the exit pupil, the greater the relative brightness the brighter the image. The effective aperture is an opening of the objective lens through which light can pass without eclipse. Generally, the inner diameter of an objective lens is specified as the effective aperture. Remember, the larger the effective aperture, the greater the resolving power, and the brighter the image. But increasing the effective aperture of an objective lens means bigger, heavier binoculars. An effective aperture of Ø 50 mm is generally the limit for manual operation. The alignment of the optical elements of a pair of binoculars to the mechanical axis is called Collimation. It is one of the most important aspects to inspect when you buy. Binoculars with good collimation should not form double image. BCI binoculars are carefully adjusted and tested for their collimation by specially trained quality controllers. We strongly recommend that you choose binoculars with metal prism holders since any smallest deformation or dislocation of holders will pervert your binoculars' collimation. Holders made from soft material such as plastic can be out of shaped in as little as few weeks, creating collimation defect and causing eyestrain and headache. BCI binoculars are itemized with two numbers followed by a string of letters. The first number represents the Magnifications Power. 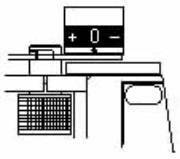 The second number indicates the diameter of the object lenses measured in millimeters. For example 821BR means they are 8 power binoculars bringing the object 8 times closer to naked eye. The size of the object lenses is 21mm. The letters at the end are associated with the model design of the product. Backed by the strength in expertise and technology of its manufacturing base, BCI produces a wide range of models, giving you the flexibility in choosing binoculars to serve your needs. For best results while wearing eyeglasses, folding down the binoculars rubber eyecups. Then place your glasses against the rubber eyecups while observing through the binoculars. 1. Keep binoculars lenses clean and free of moisture and dirt. 2. When not in use, do not expose your binoculars to direct sunlight for long periods of time (e.g., on the dashboard of your car). 3. Store your binoculars in a cool, dry place. Always store your binoculars in its carrying case, with the rubber eyecups in the "up" position. 4. Binoculars are complicated precision optical instruments: handle them with care. Do not drop, shake, bump or rattle your binoculars. Binoculars optics can become misaligned (out of collimation) as a result of rough treatment, rendering the binoculars virtually unusable. Collimation problems caused by rough treatment require repair by a trained technician. Such collimation adjustments are not covered by the Warranty. 1. Before attempting to clean any of the lenses, carefully remove, with a soft lens brush or "canned air," all grit, sand, dirt, dust, or other substances which may scratch the surfaces of the lenses. Then use soft lens cleaning tissues, a lint-free cotton cloth, or a clean cotton swab. 2. For materials that remain on the lenses, use a lens cleaning solution (e.g., a commercial optical lens cleaner, or household window cleaner) to remove grease, etc. CAUTION: Do not apply liquid directly onto a lens, which may result in the liquid seeping into the barrel of the binoculars. Apply the solution onto a cloth or swab. Then apply light pressure to remove the foreign substance with soft circular motions of the cloth or swab. Note: Excessive pressure used when cleaning dirty lenses (e.g., rubbing gritty dirt into the lens surfaces) may damage coatings. Use a light touch. 3. Once foreign substances have been removed from the lens surfaces, breathe onto the lenses to apply vapor. Before the moisture evaporates, gently polish the lens surfaces with a clean cotton cloth or lens cleaning cloth. 4. For more thorough cleaning: remove dirt or liquid from under the binoculars eyecup flange (next to the eyepiece lens surface) by removing the eyecup, gently lifting it up and carefully cleaning the entire lens surface as described above.